I want to start with a physical description of Le Corbusier’s most famous building. 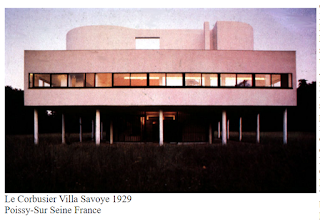 The building Villa Savoye was built originally in the country in a fairly isolated spot in nature. It was surrounded by a park-like environment that the architect, Le Corbusier, wanted to feature for the people who inhabited the building. The building appears almost to be very simple and based on clean geometric lines with large strips of windows and a large undulating curvy structure atop the building. The building sits on a series of cylinders which serve as columns. It is made from fairly inexpensive simple materials such as, poured concrete, simple metal framed windows and appears to have no ornamentation or coloring on the exterior of the building. If you look closer, under the building behind the cylindrical columns that Le Corbusier called piloti (his word for pylons or columns) there is an almost capsule shaped structure in the center of the building that contains a curved wall that is made entirely of windows and a door. The way in which the building is up on these columns and the curved wall creates an overhang and a driveway in which a car could drive up to the building, dropped its passengers off, and then not be exposed to the elements such as rain as well as most of the wind. The interior of the building is also very simple and some people would consider it bare. On the first floor you can see that there are simple cylindrical columns that run directly into the ceiling. The first floor also has a series of ramps and steps that are also not decorated or adorned and are painted white. The floor is made of simple tile and the railings on the steps and the ramps are made of simple metal tubes that looked like pipes. There is no real division between any of the spaces throughout the building especially on each floor. One could say that the building is three stories tall however the third story is a balcony type of affair that is placed almost on the roof and has a type of flow through space that begins on the second floor. This is very similar to how Frank Lloyd Wright conceived of space as well. The second-floor is a large simple room that has a strip of glass windows with no ornamentation surrounding the windows on one side. Opposite the strip of windows is a large floor-to-ceiling window with a sliding glass door that leads onto the balcony. Although there is significant natural light entering the structure from these windows there are also built in hanging strip lighting which looks very similar to the fluorescent office lighting from today. It is encased in a simple cylindrical tube and connected to the ceiling by a series of simple cylindrical pipes. The floor is made of the same tile as the first floor but changes as it continues out onto the balcony. The balcony on the second floor is surrounded by a series of walls with openings in them the same size and shape as the windows on the interior of the structure. Square and rectangular geometric planters are placed throughout the space. There is a ramp that leads to the roof of the structure that serves as a third story balcony. The ramp is also on adorned but has a simple railing of white tubular metal. The roof of the structure contains a simple wall that has some curves built into it as well as a window shaped opening and as in the balcony on the second floor, it contains no glass but looks to be almost the same size and shape as many of the windows throughout the structure. The description above describes a fairly on ornamented building that would be fairly inexpensive to build, although I suspect it was fairly expensive at the time, because it is made from almost “humble” building materials such as concrete, simple tiles, factory manufactured window frames and glass and pipe like tubing as handrails and ornamentation. This is fairly intentional because it addresses what Le Corbusier was attempting to do in his conception of what it building should be. Here’s an analysis of the concepts that Le Corbusier used to design this building. Le Corbusier conceived of the building as a type of country home in which the windows framed the environment on the exterior of the building almost as if the landscape outside were paintings. 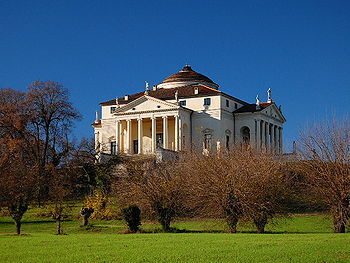 This is in keeping in some ways with some earlier concepts such as the Villa Rotunda by Palladio in the 16th century. Palladio conceived of his building as a place to go and enjoy nature and to this purpose he placed for patios or porticos (belvedere in Italian means "beautiful view") on the exterior the structure. Le Corbusier uses windows to do this. However, Le Corbusier also wanted the inhabitants of the structure to be protected from the elements. This is why there are so many windbreaks on the patios. Also like another architect, but I think he came up with this separately, Le Corbusier shares what Frank Lloyd Wright believed in terms of placing the building within nature and having flow through space. 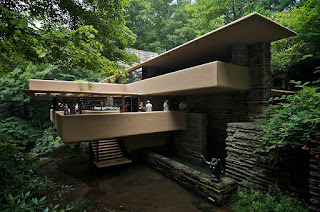 Le Corbusier deviates from Frank Lloyd Wright in that he felt that the building did not need to integrate itself with nature the same way other buildings such as Frank Lloyd Wright’s building in bear run Pennsylvania called Falling Water. In fact, Le Corbusier conceived of the building as a type of machine that people lived in, almost the way cells inhabit a human body. He also felt that the people who inhabited the structure needed to be protected from the elements and that is one of the reasons why he has the building set up on the columns and an automobile is able to drive up to the structure and discharge its passengers without the passengers really having to deal with the outside environment. Part of this, comes from Le Corbusier’s ideas and appreciation of early century passenger ships that were more functional in some ways than concerned with form. Passenger ships from the early 1920s and 30s contained exposed pipes, pipe like railings as well as very simple on ornamented designs for things like portholes because the function was more important on a ship than the appearance. For Le Corbusier the appearance of the functional items was beautiful and he wanted to incorporate that into his architecture. If you think about it, Villa Savoye almost looks like an ocean liner in some ways. Here’s a bit more about Le Corbusier’s career and context. In the previous section I suggest the ideas that Le Corbusier was attempting to create a sort of machine that human beings inhabited. Le Corbusier conceived of architecture in a different way than some of the architects from the previous centuries and this is probably because in the early 20th century artists and architects often established themselves by coming up with a new shocking vocabulary or style of art. Le Corbusier felt that standardization and regular planning would save cities and buildings by organizing the spaces more effectively and efficiently. He felt it would aid in the cleanliness and health of the inhabitants and would be based more on the human experience however, this theory was not proven when some of his larger projects were created. He designed a series of complexes and they were executed however people didn’t care for them and many of them have been torn down. The takeaways from this are, early 20th century architects often try to establish an entirely new theory or ideal of architecture. Sometimes this is successful and sometimes this wasn’t. In the case of Le Corbusier his conception of architecture was that it should be a building that human beings inhabited almost like organisms. He also was heavily influenced by mass manufacturing and ideas that rejected previous conceptions of architecture that would be highly ornamented or based on classical ideas. Le Corbusier seems to have had a type of romance with technology especially with automobiles. It also seems from his architecture that he felt almost as if nature or the irregularity and unpredictability of nature was something that the human being needed to be protected against. Unlike architects from the Baroque era who designed the gardens at her side, Le Corbusier did not feel that nature needed to be controlled but that humans needed to be encapsulated or isolated from it with controlled use of it.